Two really great things happened this week. One happened on Tuesday evening when we re-elected our president. The other happened a few days before at the From Scratch Club food swap. 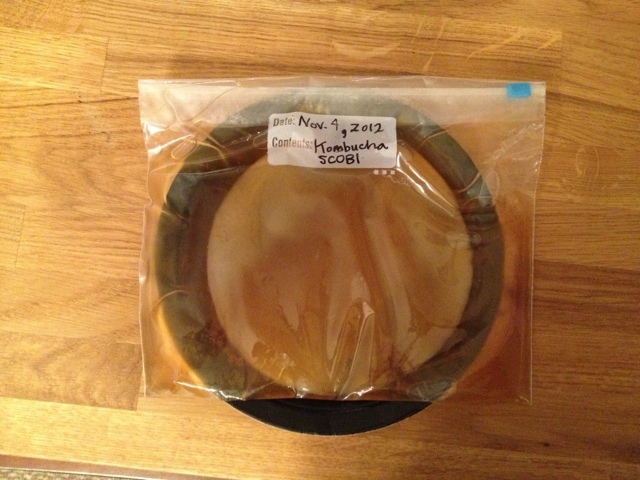 Last spring, my original kombucha scoby died. Yes, the mother starter culture for my fermenting experiments. It was compromised, contaminated somehow, and grew mold. Out it goes. I have been scoby-less since that time. A few weeks ago, I tried to grow my own from storebought kombucha using these and these instructions. Nothing happened. Nothing at all. 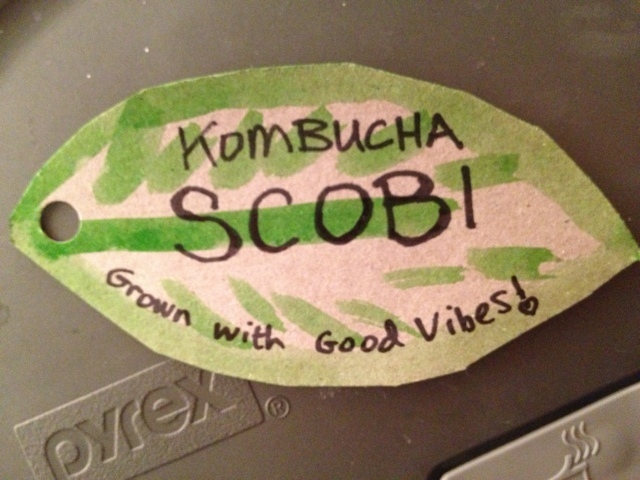 I was still scoby-less. I wasn't planning on swapping anything at the food swap, but at the last minute I grabbed a jar of tomato jam and a jar of bread and butter pickles from our pantry, just in case someone had a scoby to swap. We used to see more of them at food swaps, but I don't think I have seen one up for grabs in months. Many many months. So the odds seemed low. I knew it was a stretch. But then! 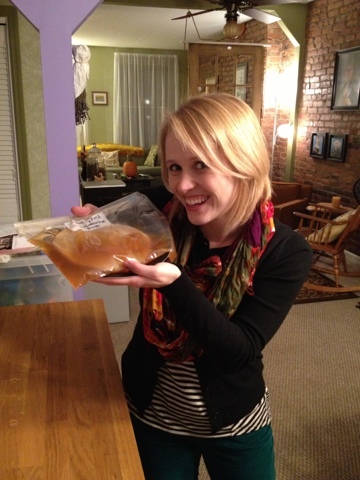 An adorable mother/daughter team walked in holding the most glorious, absolutely disgusting-looking scoby. It was in a ziplock bag with kombucha, flopping around on top of a paper plate. I wanted it. So I stalked them until they swapped with me. Well, I hope I was more gentle and non-threatening than that, but either way they graciously swapped me their scoby for a jar of my tomato jam. That is the magic of food swaps, my friends! A new episode of the FSC Podcast is available for your listening pleasure! We interview the wonderful Alana Chernila and are bringing all of her food & writing wisdom, directly to you. Swappity swap. We had our first FSC Swappers: Albany event on Sunday. Our generous host, All Good Bakers, provided a great spread and location for our first "go" in Albany. The place was packed with swappers and tons of new faces. So for any swap-curious folks out there, know that it is 100% awesome to show up by yourself. You will leave with good food and good friends. I got to meet so many people that I follow online- it's so nice to have an actual face to associate with a blog or Twitter account! Check out this Flickr group for WAY more photos of the swaps, including some particularly excellent ones from Renee, our quasi-official photog at the Albany swap. Yup, I made it a booze swap. I brought strawberry-raspberry infused tequila with honey and a twist of lime. JEALOUS? I also made some biscuits using fresh dill and the leftover whey from the cheesemaking party that I still need to tell you about. The tequila was more popular than the biscuits. Guess that should have been obvious. The spread! Salads, slaws, croissants & quiche. Swapmaster Chris lays out the ground rules and sets the swappers loose. Scored: Corn salsa, beet hummus from Sarah, samosas from Liz at Brown Betty Farm, lavender tea cookies, hom-a-rah (Syrian red pepper dip) with pita chips and I even snagged Leah the Nosher's sample jar of pickles. These FSC 'Toga swappers BROUGHT it. There was challah, English muffin bread, pear butter, homemade sour cream, fermented half-sours, garden veggies, Asian slaw, quiches, granola, zucchini muffins, strawberry sauce, pull-apart cinnamon bread, ginger simple syrup, whole wheat hamburger rolls, avocado-feta salsa and lots more. It was really incredible. I felt like a kid in a candy store. Scored: sweet potato & zucchini muffins, a kombucha SCOBY, asparagus and goat cheese mini-quiche from Ashley (owner of The Common Thread), ginger syrup (for homemade ginger ale!) and pear butter from Jen. Boo yah. Now that I have a few swaps under my belt, here are some thoughts. In bullet point form, because it's been a long week. Label your swap items! It's helpful to write out a list of ingredients so peeps know what's in 'em, but I think it's really nice when items are also labeled with the person's name and blog/twitter/whatever, if applicable. That way when I get home with my goodies, I'll remember exactly who I got things from and how I can track them down to get more. Don't be afraid to bring some "weird" stuff. These swaps tend to draw a happy, foodie crowd that loves experimenting. Meals that are ready-to-go are awesome... almost every one of my lunches this week was a swap item. But keep in mind that a lot of people (though not all!) are pretty creative home cooks, so jars of homemade ingredients are also a big sell. Think jams, sauces, dressing, starters etc. Personally, I tend to go after savory stuff versus the sweets. Which is crazy, because I have an insane sweet tooth but even I recognize that it's not a very smart idea for me to come home with a dozen cupcakes, a batch of cookies, three pies and a ray of brownies. I like to stock up my pantry or supplement my planned meals for the week. Finish strong and don't give up. Even if it seems like the swapping has wrapped up, I guarantee there are people out there with some swap items yet. Maybe they'd like to take them back home, but maybe they are looking for a swap buddy! Stick around, chit chat and scope out the scene for closing call swaps. And if you aren't able to trade all of your items, that's actually pretty great because you get to take them home and enjoy the fruits of your labor! I couldn't get rid of my last set of biscuits at the Albany swap but they happened to be delicious so I didn't mind bringing them back with me. It's ok to bring a lot of different things. I haven't done this, but I love when one person lays out this crazy spread of things. Also, it seems to be easier to swap when you have some variety rather than 40 jars of jam. Then again, if your jam is crazy awesome or you have a famous recipe for something, go ahead and bring 'em all. Phew, what an insane few days it's been. Meetings before work, meetings after work, swap prep, kitchen voting, my Facebook giveaway and to top it off, we're rocking near-100 degree temps here. I will admit to hiding out at the mall last night for a bit of heat relief and walking away with four or five new dresses. They were on super-sale! Couldn't help it! Blame it on the heat. Greens, rosemary, summer squash (I will never get sick of summer squash), beets (At some point I'm sure I'll get sick of beets but it hasn't quite happened yet) and cucumbers! You know your CSA delivery rocks when your delivery gal sends you a text notifying you that not only are your veggies there, but that your Zappos order came too. Fresh produce & new shoes! Perfection. I had a nice four-day weekend. Did some stuff, did some more stuff, laid around outside, went to a barnside movie party & swapped some infused tequila for really awesome things. More about the food swap later. Albany swappers really brought it. It's a crazy double-swap week for me, with Albany's yesterday and the 'Toga swap on Wednesday. Yowzas. Will report back... say, Friday? 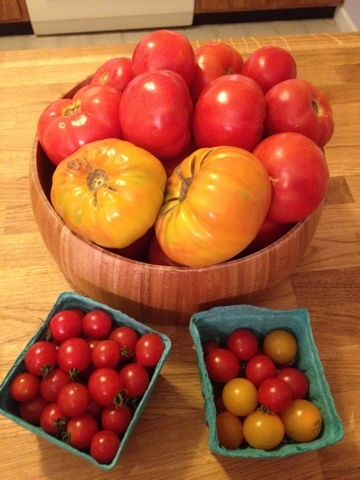 Yes, Friday will be a food swap round-up. If you aren't on board yet with strangers swapping food, you will be soon. It's so fantastic. Actually, if you are a local reader, just sign up for the Saratoga Swap and see for yourself. You don't even have to swap anything if you don't want to, you can just chit chat and check it out.